This is a transcript of a podcast interview with Dr Ruth Elwood Martin and Mo Korchinski about their work in Canada with women in prison: Arresting Hope – Women Taking Action in Prison Health Inside Out, conducted by André Tomlin @Mental_Elf. Recorded at the the Cochrane Colloquium 2018. You can also listen to the podcast below. Welcome back everyone. It’s André here and I’m here with Mo Korchinski and Ruth Elwood Martin, who have just had a standing ovation; the only standing ovation I witnessed at this conference, Cochrane For All, because you just did the most amazing keynote presentation, the two of you, and you really touched people in the room, I think. It wasn’t just a, kind of, that’s a great project; people were really moved by what you presented. So, congratulations for that and thank you so much for doing what you did. Now, I wanted to start off by asking you, what’s the prison system like in Canada? Is it a kind of open and closed system? What’s a typical profile of a woman in a Canadian prison, in terms of vulnerability and trauma and mental health and addiction and poverty? Can you give us a picture of that? Yes, well we have two prison systems in Canada. We have the provincial, where two years last a day and the federal, where it’s two years plus a day. So I basically work with people in the provincial system because there’s less funding in the provincial compared with the federal. So, the average stay is anywhere from 30 to 90 days. So, very short sentences, just long enough for women to lose everything they have on the outside, go in and then come back out with nothing and have to start again. And it’s a cycle. So, I know with my job when I was in my first one, it was 11 months, there were women who came in ten times, the same woman, so, as one of my documentaries is called, “Revolving Door”. Right, because it’s such a revolving system. Right, when we’re just in and out, in and out and they only get 30 days, 20 days. The sentences are really short, right, and the population 95%, if not higher, are all drug addicts, who are in jail because they were supporting their drug habits, and a lot of mental health now. What backgrounds do they come from in terms of their experience of trauma, and poverty? Well, our population is probably 50% first nations, aboriginal population, but most of them are childhood trauma. We’ve actually just started a study on childhood trauma, and from our research from dealing with and being in, as a peer of the women, being in jail most of us all come from childhood trauma, somewhere along the line. I mean why else do you choose to pick up a drug, right? And numb your life? And walk away from your children? I always say how powerful drugs are, is when a mother can walk away from her children, right, and it controls you. Ruth, how did your creative work come about in the first place? And how did you engage the kind of wider prison and healthcare team in that work? So, as I started first of all in the prison as a prison doctor, kind of a bit dubious about whether I should be doing this because it didn’t seem like it was a very prestigious kind of job but when I, when I…from almost the first time I worked there as a prison physician, I was just struck by the health disparity and the illnesses that I was witnessing and, you know, looking in the international medical literature, it’s worldwide, in prisons all across the world. In the literature I read, I became aware that this is a public health opportunity and so what should I focus on? So I thought well, maybe if I did…sort of look at PAP smear screening1. So, I’d seen a couple of women in the clinic, who had invasive cervical cancer. We know from the evidence this is a preventable disease, if women take part in screening, and I thought well, maybe we could do an intervention where we try and increase the PAP smear screening that we’re offering inside the prison and provide education. And so I got involved in that for quite a few years and we designed and led and implemented an intervention, and then we linked actually to the provincial registry to compare it to the general population. But we were also able to look at the PAP smear screening rates following the intervention; we realised, disappointingly, that women following their release from prison didn’t actually continue with PAP smear screening, as they had in prison. So it kind of made me realise that, actually, maybe cervical cancer screening isn’t top on the list of the women’s health priorities. And, at about that time, I did an online course called Action Research, which I’ve now, kind of, renamed as Community-based Participatory Health Research and in that kind of research you invite the participants to help design the research questions. What are the important research questions that we should be looking at? And then you invite the participants to partner with you in designing the study, and in gathering the data, and interpreting the data, and in disseminating the results. So, as I was doing this course, I was thinking, ooh this is the type of research we should do in prison and we should, you know, invite the women to be a part of this. And really, several relationships made that possible. I couldn’t just do it by myself, as a prison doctor. You really have to engage the whole system in order to, obviously, start that kind of research. But I was very fortunate at that time, as the prison warden was somebody who, when I explained about participatory research, it was completely congruent with what her vision of what a therapeutic prison was going to be. So, she was very enthusiastic and then also, in the prison, there was the recreational therapist and she was enthusiastically supportive, and then the aboriginal elder, Elder Mary Fant. She was initially quite suspicious of what research was but when she realised this type of research is what we were offering, she was again very enthusiastic. So, as a result, there were some very key champion people within the prison system, who all thought this was an amazing idea, and so it was, basically, a green light to proceed. Hmm, interesting. Tell us why you think creativity is healing and transformative in this context. What is it about that process? For me, as someone who was there, as it was starting, you know, and the buzz through the jail, it was a lot of opportunity for people for the first time to speak up and get their voices heard, and you know as Alison and Dr Martin and everybody said, “You guys are the experts”, you know. We’re experts? No one has ever called us anything except for negative comments, right. All of a sudden, you have these positive comments and, you know, I guess women, when they get…now they’ve left the street life, they’ve left the drugs, they come in, right, and as soon as women come in, they’re like, that’s it. I’m done. I’m never going back to it. I’m never using drugs again. And it’s a really good opportunity. These people already want to change, right. They’re done, right. So, they’re just like sponges, right. They just want it and like I was saying in my talk, the range of topics women talked about. There’s nothing they didn’t bring up, right. Just to get their voices heard, right. It’s being ‘un-silenced’, right. So when we started…When the women wanted to continue working on the research team, I was just amazed about how enthusiastic and how creative they were. So, in the prison, there were a couple of computers that the women could use and they taught each other how to do Powerpoint presentations. So they wanted more research forums and then they would present on their passion, whatever topic they were researching, but they would have to go to the correctional offices or the healthcare nurses to say, “Could you go on the internet please for us, and research this topic? We need more information about this topic”. But then the women who actually knew how to use a computer, would teach the other women how to do it. So they would learn from each other. But when they actually presented their Powerpoint presentations, I have never seen such creative Powerpoint presentations – things zooming in and out and it was just incredible the creativity that went in, in terms of the Powerpoint presentations, and the sort of innovative ways, while they were in prison, of trying to get their message across. So, writing letters to community health organizations on the outside, writing to advocacy groups, inviting them to come visit them in the prison, people who are illustrators, or artists, getting involved in doing a lot of art work. Yes, I was going to ask about that. How has the project kind of engaged or changed the culture, I suppose, both within the prison and in the wider community? Have you noticed that? I know, like, when we were going in the prison, it was amazing because it was always us and them. You know, the correction officers and then the inmates, right. And there was always that divide. And then I think as women were standing up there and telling their stories and doing their presentations, it really was life changing for the correction officers as well because they actually started now looking at the women instead of being, “You’re just a last name or a number”. They all of a sudden looked at you as a person and a human and as somebody who, you know…and that’s one of the reasons why I do these presentations at conferences and newspaper articles, to humanise people. Right. They looked at these women as humans not just as a job. Right. So how much has it changed? You know, it changed amazingly, the whole atmosphere inside the prison, you know, for everybody who was involved. So important. How was the kind of peer support aspect continued? So when women leave the prison now, is there ongoing peer support? I notice you have a Facebook group. Is that a way that you deliver that? Yes. So, when it was ended, we started up a group called “Women into Healing” because, like I said, our prison, we have one provincial prison for all BC [British Columbia]. So women are like five, six hundred miles away from their home. So how do we stay connected? How do we support each other? Because we are a really close knit community. It’s a family, you know. Inside jail is a family. It’s a community and that’s why our book is called “Arresting Hope and Releasing Hope”, it’s because you actually have hope inside. You have the support, it’s a family. Some of my fondest memories are from when I served time. You know, I have a drawer full of photos. Some of my best relationships are still from people I met in jail. But when you get released, you’re plucked out of that. And here, you’re going your own way. How do you find your way? You’re dropped off three or four hundred miles from home and they say find your way home. So we’ve started a peer mentor programme, where we hook up with women before they get out of prison and find out what their health needs are, what they need help with and what support they need. Most of it’s clothing, food, shelter, right. We have a huge homeless problem – a shortage of affordable housing. So it’s a huge one. So what’s the chance of somebody who gets plucked out of there and just goes back to where they came from? They’re going to end up back in jail right away, right. Nothing changes, nothing changes. So for us, as a peer, I want to support women, so they can see what it’s like not being in the drug world, not doing crime, because it’s amazing out here. You know, I travel. I have my kids back in my life. I’ve got an education. I just want everybody to see how wonderful life can be. And there was something, Ruth you said at the beginning that I thought was so important, which is your kind of attitude to working in prison. You were sort of saying, this wasn’t the most amazing job. How can we encourage amazing clinicians and professionals to work with this population in this setting? I think you’ll never be bored if you work in the prison. We need compassionate, caring people. There is very little published about prison health, about illness, disease, health. It’s a phenomenal field. Yes. I think connecting with others. 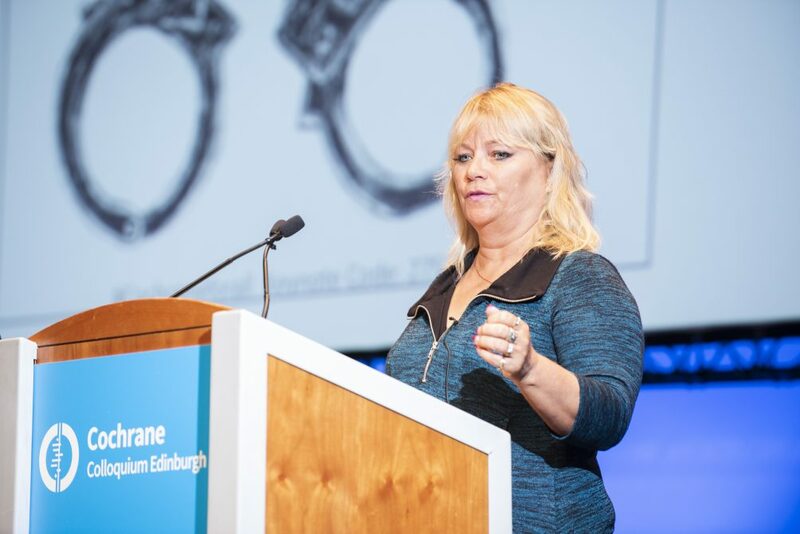 So, I was quite inspired over the years with the World Health Organization “Health in Prison” project in Europe and would come annually to their meetings. Whephren [Worldwide Prison Health Research and Engagement Network] is an organization that Dr Emma Plugge is involved in and there’s a web page of prison health research (https://wephren.tghn.org/) and so there’s various support now for people who are interested in this population. I would just say it’s an amazing opportunity to actually really get involved. It’s got its challenges, I’m not denying that, and it can be quite lonely, but I think if you connect with other people electronically, in other ways, conferences, then you can actually kind of get remotivated, I suppose. Thank you. I think it’s great that Cochrane has invited you along to this conference. It really stood out on the programme and yes, it’s amazing work. So good luck as you go forward with it. Thank you very much. Thank you. 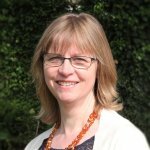 Sarah's work as a Knowledge Broker at Cochrane UK focuses on disseminating Cochrane evidence through social media, including Evidently Cochrane blogs, blogshots and the ‘Evidence for Everyday’ series for nurses, midwives, allied health professionals and patients. A former registered general nurse, Sarah has a particular interest making evidence accessible and useful to practitioners and to others making decisions about health. Before joining Cochrane, Sarah also worked on systematic reviews for the University of Oxford and the Royal College of Nursing Institute, and obtained degrees in History from the University of Oxford and in the history of women’s health and illness in early modern England (MPhil., University of Reading).